← BLOOM WHERE YOU ARE PLANTED! OBSERVATION: What is “Wisdom”? Is it amassing great volumes of knowledge? Is it found in the length of years that we live, or the level of experience we attain? Is it marked by a degree of recognition or the accolades of others? Is it simply the “Fear of the Lord”, or is it something more? In Solomon’s prayer and request to the Lord we get a glimpse at the very essence of true wisdom. And the good news – it is attainable for all! True wisdom does not depend on one’s age. In fact, there are as many foolish old people as there are young people. Simply the years we live does not measure the wisdom we possess. There are many who live their entire lives simply making the same mistakes over and over again, never really learning anything. 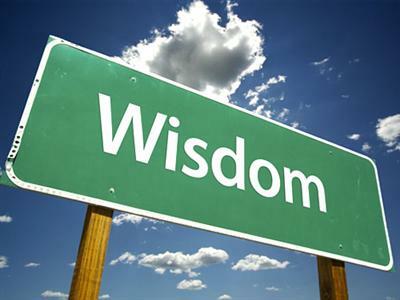 Wisdom is not dependent upon age, but true wisdom will grow with age. Solomon made his request to the Lord as a very young man. Looking over the vastness of the responsibility he had just received, Solomon is humbled before the Lord. The essence of true wisdom is not simply humility, but humility is the prerequisite for receiving true wisdom. It is only the humble heart, that realizes it does not possess the wisdom it needs, and cries out to the Lord, that positions one’s life to receive God’s wisdom. True wisdom is simply this – “A Heart That Listens”! This is what Solomon prayed for. He knew his knowledge was limited. He knew his experience was that of a novice. He knew the path before him was unchartered and unknown. Yet, he remembered the words of his father David, given to him right before David’s death. And there it was, the pathway for true wisdom – “Obey his directions, laws, commands, rules, and written instructions as they are recorded in Moses’ Teachings.” How could a young man like Solomon do this without losing his way? There was only one way – he needed a “heart that listens”. This is the essence of wisdom. This is the beginning step, the continuing step, and also the finishing step. We never outgrow this call. We never reach the place where we do not need to “hear anew”! We must constantly and continually hear the voice of the Lord. The “fear of the Lord” is the beginning of wisdom. The “heart that listens” is the continuation and completion of wisdom! This entry was posted in I Kings. Bookmark the permalink.